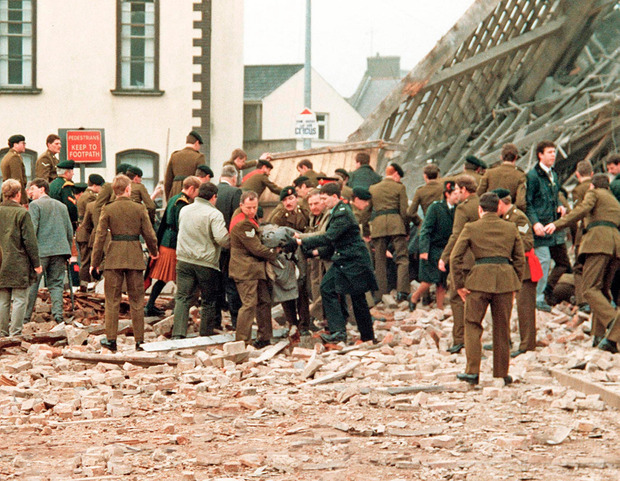 Secret files have revealed government fears that the Remembrance Day atrocity in Enniskillen might have proved the opening salvo in a brutal new IRA bombing campaign enabled by arms and explosives supplied by Libya's Muammar Gaddafi. Taoiseach Charles Haughey was so appalled by the IRA bomb attack, which killed 11 and wounded 63 others at the Poppy Day ceremony, that he personally contacted UK prime minister Margaret Thatcher to express his outrage. It sparked a succession of memos to the British prime minister aimed at resolving issues over the new Extradition Act, which Britain had been seeking from Ireland since before the Anglo-Irish Agreement. Mr Haughey also later led mourners at St Patrick's Cathedral in Dublin, where more than 4,000 people gathered inside and outside to show solidarity with the Enniskillen victims. The 1987 State archives have revealed the scale of revulsion within the government over the bombing. A confidential Department of Foreign Affairs assessment noted pressure on the government from media outlets in the UK, US and other countries for tough action on extradition of IRA members sought by the UK. "The bombing has increased pressure for approval of the Extradition Act," one diplomat acknowledged. Another memo noted Ms Thatcher's warning that: "Events are speaking very loudly to those who have important decisions to make." This was interpreted as a reference to Ireland's new Extradition Act.